Construction along Figueroa will begin next week, April 3-7, with the removal of two median islands near USC's McCarthy Way (between Jefferson and Exposition). While the center lanes will be closed for safety, nearby parking will be restricted in order to maintain two lanes of moving traffic. Work will only take place during the workday (9:00am – 4:00pm), but some of the changes are expected to remain in place overnight through Friday afternoon. 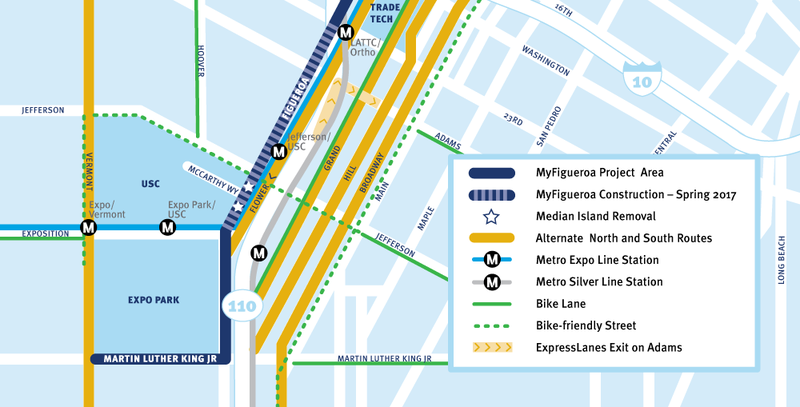 The following week of April 10, construction crews will begin to install five new bus platforms on Figueroa, between Exposition Blvd. and 23rd St. This work will also require some parking restrictions and limits to turning movements along Figueroa, in order to maintain two lanes of moving traffic at all times. While work is expected to only take place during the day, these changes will remain in place overnight and for the next several weeks. As this project progresses, you can avoid traffic by trying a different way to go. We can help you 'Fig It Out' — try biking, transit, or an alternate route—see our Getting Around page for all sorts of tips! If you missed it, we have also posted the full MyFig construction schedule at myfigueroa.com. The schedule is subject to change, but you can expect to be see a completed MyFigueroa by September, 2017!